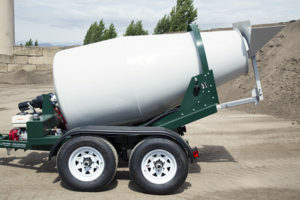 If you have worked concrete often enough you can recognize good concrete either by looking inside the cement mixer or watching as it comes out of the mixer and goes into the wheelbarrow or form. 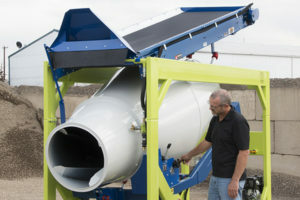 Whether your mixer is a 6 cubic foot Home Depot cement mixer or a 1-3/4 cubic yard mixing trailer, you’ll be able to see good concrete in the way that it flows through the mixing fins and over the transfer fins. If you been in the concrete industry as long as I have, you’ll also be able to hear good concrete. 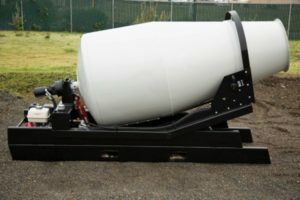 Many are the times I’ve told friends or employees the mix is way too dry or too wet just by walking past the cement mixer and not even looking inside. Good concrete not only looks good, but it sounds good, too. When concrete is too dry, all you will hear are the rocks bouncing off the inside of the mixer. It’s as if there is nothing in the cement mixer but a handful of rocks and a little sand. Instead of the mix flowing through the paddles and over the fins, it’s carried further up the side and when the rocks fall they hit the fins or the barrel and make the sound of..well, a rock hitting metal. Adding a little water will loosen up the mix. On the other hand, when the mix is too wet, you won’t hear the rocks falling. In fact, you hear very little. No sliding sound of flowing concrete, just a faint hint of the paddles splashing in the water. 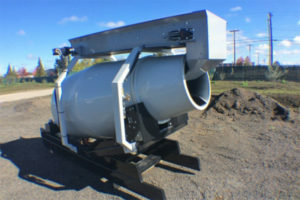 The larger the mixer, especially in a 1-yard concrete mixing trailer, the louder you will hear the splash. This is also easily fixed by adding more material to tighten up the mix. However, you have to add the proper quantities of all three ingredients (sand, rock, cement) to keep a good mix. Be sure to add them in the proper ratio. So, you’ve all heard the saying to keep an eye out for something, right? 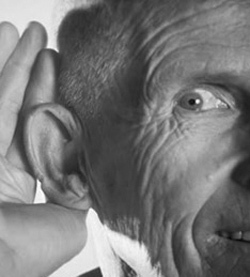 Now you know that with enough experience, you can keep an ear out, too!